I like the Eisenhower Matrix a lot: In everyday life, the simple concepts often tend to be the most practical ones, and in the end, usually also the most useful and powerful ones. Remember: “Everything should be made as simple as possible, but not simpler” (although that’s also a reminder to not over-simplify things). 1. INBOX: If urgent & important: DO! 2. If urgent & not important: DELEGATE! 3. If not urgent & important: DECIDE+PLAN! 4. Rest: Not urgent & not important: ELIMINATE! This would guarantee, that first, all incoming tasks/requests (e-mails, phone calls, mail, visitors, time-triggered events, other events, ..) would get proper (highest) attention and get collected in the INBOX list. They would then be triaged (qualified) and, if appropriate, distributed/moved to the other lists accordingly. If nothing else matches, they would end up in the low priority box (not urgent AND not important), i.e. the equivalent of a “trash”. Integrating a particular product’s Kanban workflow would require adding further “sub-lists” for each of the steps of the product lifecycle. Or one could also think of using a separate board for each of the 4 states of the Eisenhower matrix, with lists representing the Kanban states/stages connected through Kanban JIT processes. Note that each team member can (and should) have her/his own Eisenhower sub-matrix in addition, also combined with her/his own Kanban sub-workflow. 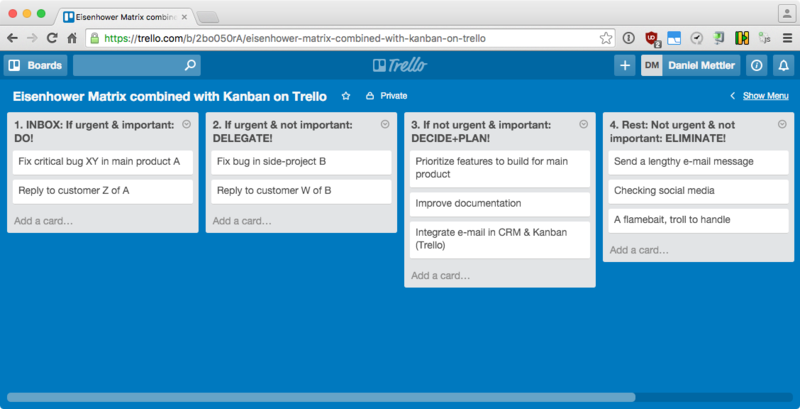 These would ideally be represented by sub-lists, which don’t exist in Trello (yet?). Currently, one would thus have to improvise a bit and e.g. use cards for them, using comments as “sub-cards” – or add further lists, e.g. “1.1 capture”, “1.2 clarify”, “1.3 organize”, “1.4 reflect”, “1.5. engage”. One could also treat the above combination of the Eisenhower Matrix and Kanban as an application of the 5 GTD workflows and do without making those explicit. At the moment, I favor this view and, for simplicity, don’t recommend visualizing these GTD “meta-workflows”. Disclaimer: The ideas proposed here are “work in progress”, likewise this post. This is just one example of many imaginable ones. I’ll probably edit this post or clarify, correct or extend it in follow-up posts.